Firstly, I would like to express my most sincere thanks to the President of the General Assembly and the Permanent Missions of Gabon and Germany, UNODC and the Wildlife Conservation Society for inviting me to join you today. The World Wildlife Crime Report is the first report to compile and analyze the best available primary data and to provide a robust assessment of illicit wildlife trafficking. It is thoroughly researched, with a logical and well thought through analysis and it is written in an easy to read style. 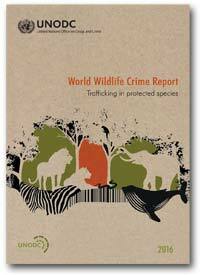 We have seen a number reports on wildlife crime over the past few years but this Report demonstrates a heightened sense of rigour in reporting on illicit wildlife trafficking, including through the compilation and analysis of 164,000 seizure records sourced from CITES and the WCO and others. It has sent the benchmark for any future reports on such crimes and it is the now the definitive report on Wildlife Crime, which will improve over time as the database is expanded and enhanced. The Report shows that illicit wildlife trafficking affects all regions in different ways with countries across the globe being implicated as source, transit or destination States, affecting over 7,000 different species. It confirms the industrial scale and serious nature of this illicit trade, which is being driven by transnational organized criminal groups and is fueled by corruption. In 2010 the UN General Assembly expressed its solemn commitment to an international order based on the rule of law and international law and emphasized the role of multilateral treaty processes in promoting and advancing the rule of law[ii]. The Report highlights the importance of CITES and the two UN Conventions against corruption and transnational organized crime working together, which was also highlighted in the UNGA Resolution. CITES is described in the Report as “an agreement of remarkable scope and power” that “ allows countries to reciprocally protect one another’s’ species according to a common set of rules”. As stated in the Report, CITES defines the international rules that criminals try and circumvent and the two UN Conventions are the key international treaties for tackling the transnational organized criminal groups that are driving this industrial scale illicit trade and the pervasive corruption that enables it. I am delighted to report to you today that the cooperation between CITES and the UNODC and the two UN Conventions against corruption and transnational organized crime is at an all time high and is only getting stronger – and I would like to express my sincere thanks to Executive Director Fedotov for his leadership and his good staff for their extraordinary support. It has been my great personal honour to work closely and directly with Executive Director Fedotov since we signed the agreement for the creation of the International Consortium on Combating Wildlife Crime (ICCWC) in November 2010 at the Global Tiger Summit in Saint Petersburg. The Report does not just address enforcement; it also highlights the importance of demand reduction. The Report finds that “illegal wildlife trade is a series of related but distinct illicit markets, each of which must be independently assessed for its unique characteristics.” As such, while mass public awareness campaigns clearly have an important role to play, we must also have well targeted demand reduction campaigns, as was called for in the UNGA Resolution, noting that to be effective public awareness raising must lead to behavioral change. 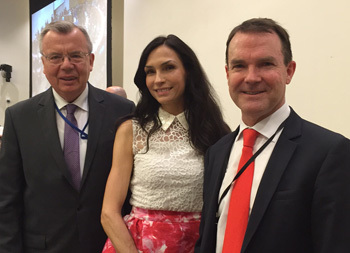 The good news is that there is today a global collective effort underway to combat illegal trade in wildlife – one that takes the three pronged approach of enhancing enforcement, including tackling corruption, addressing how local people can benefit from wildlife and demand reduction. This effort involves countries, the UN, treaties, international and national organizations, such as the WCS, philanthropists and individuals. We must continue to enhance the efforts that are already underway – to fully capture the high level of political interest and additional financing, including from the GEF, that is now available. Looking ahead, future Reports will be able to access enhanced data to further populate the World WISE seizures data base, noting that from 2017 CITES 182 Parties will provide annual reports on illicit trade as well as legal trade. Speaking for CITES, we would love to see, and fully support, the World Wildlife Crime Report becoming an annual report just as we have an annual Drugs Report and we will offer the UNODC our full support in this regard. Finally, the 182 Parties to CITES meet once every three years and they will next convene in Johannesburg, South Africa on 24 September where these issues and many more will be on the Agenda in what is shaping up to be one of the most critical meetings in the 43 year history of the Convention. We hope to see you all in South Africa! [i] The 2015 UN General Assembly Resolution on tackling illicit wildlife trafficking reflects the level of international consensus that now exists around bringing these highly destructive crimes to an end.